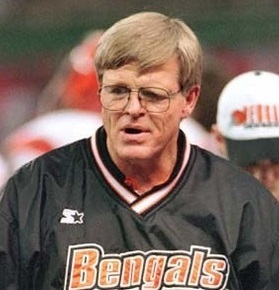 The Cincinnati Bengals had a new head coach as they hosted the Jacksonville Jaguars on October 27, 1996. Off to a 1-6 start, David Shula had been let go and replaced by Bruce Coslet (pictured above), the offensive coordinator who had once coached the New York Jets. The son of the highly-successful Don Shula had been a major disappointment, failing to turn around a team that had not posted a winning record in six years, and the Bengals had recently been prone to blowing leads in the second half. It was hoped that Coslet, known as a motivator in New York, could provide a needed spark. The opposing Jaguars, a second-year expansion team, came into the game with a 3-5 record. While Head Coach Tom Coughlin’s club had the league’s top passing offense, Jacksonville was still a work in progress. QB Mark Brunell was mobile and a talented passer, but thus far also lacked consistency and was prone to throwing interceptions, and the running game was not providing much help. There were 45,890 fans in attendance at Cinergy Field on a pleasant day, well under the stadium’s capacity. The Bengals had the ball first and drove from their 18 to the Jacksonville 30 as QB Jeff Blake completed passes to RB Eric Bieniemy for 13 yards and WR David Dunn for 26, but came up empty when they failed to convert a fourth-and-one play. The teams traded punts for the remainder of the opening period. As the game headed into the second quarter, the Jaguars put together a 75-yard drive in seven plays. 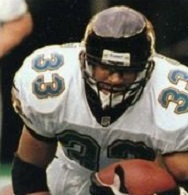 Mark Brunell threw to WR Andre Rison for 32 yards, RB James Stewart (pictured at left) had carries of 13 and 12 yards, and Brunell finished the series off with a 14-yard run for a touchdown. Mike Hollis added the extra point. A short series by the Bengals again ended with a punt, but Cincinnati got the ball back three plays later when Brunell was hit by DE Jevon Langford as he was passing and LB James Francis intercepted the errant throw at the Jacksonville 31. It took the home team five plays to capitalize as Blake connected with TE Tony McGee for 18 yards and WR Carl Pickens for an 11-yard TD. Doug Pelfrey added the game-tying point after. That was it for the scoring as the teams exchanged punts for the remainder of the half, much to the displeasure of the home fans. Following another exchange of punts to start the third quarter, the Jaguars advanced 73 yards in eight plays. Stewart broke away for a 34-yard run on first down and, keeping the ball on the ground with Stewart and RB Natrone Means, the visitors reached the Cincinnati 11, from where Brunell threw to Means for a touchdown. Hollis converted and the Jaguars were back in front by 14-7 with 2:41 remaining in the period. The Bengals had the ball as the third quarter concluded, with Blake throwing to Bieniemy for 13 yards in a third-and-seven situation and then connecting with WR Darnay Scott for 46 yards to the Jacksonville 10. On the first play of the final period, Blake tossed a scoring pass to Pickens from there and Pelfrey’s kick made it 14-14. The Jaguars had to punt from deep in their own territory on the next possession as Brunell was sacked twice for losses totaling 19 yards. The Bengals started their series from their 40 and went 60 yards in 11 plays. Blake completed four straight passes at one point, two of them to Pickens, and ran for 10 yards to convert a third down. The payoff came when Blake ran an option play and flipped the ball to RB Ki-Jana Carter, who scored a one-yard touchdown. Pelfrey again converted to put Cincinnati up by seven, although Blake was shaken up and had to sit out the remainder of the game. On Jacksonville’s next play, Brunell’s tipped pass was picked off by FS Bo Orlando, giving the Bengals possession at the Jaguars’ 22. Backup QB Erik Wilhelm threw to Pickens for five yards and Carter ran four straight times, the last for a four-yard TD. Pelfrey added the extra point to make it a 28-14 game with 3:32 left to play. The Jaguars managed to drive to one more touchdown, with Brunell throwing to WR Jimmy Smith from 11 yards out, but they couldn’t recover the resulting onside kick and the Bengals were able to run out the clock and win by a final score of 28-21. Jacksonville led in total yards (338 to 267) and also had the edge in first downs (19 to 18) although the Bengals had the ball longer (31:36 to 28:24). The Jaguars also recorded five sacks, to four for Cincinnati, but they also turned the ball over twice, to none suffered by the Bengals. Jeff Blake completed 19 of 30 passes for 244 yards and two touchdowns while giving up no interceptions. Carl Pickens had 6 catches for 51 yards and two TDs and David Dunn gained 66 yards on his three receptions. Eric Bieniemy pulled in 6 passes for 47 yards in addition to running the ball five times for eight yards. Ki-Jana Carter (pictured below) filled in for Garrison Hearst, who sprained his ankle in the second quarter, and topped the Cincinnati runners with a modest 27 yards on 8 carries, although two were for touchdowns. For the Jaguars, Mark Brunell was successful on 18 of 31 throws for 215 yards and two TDs, but also with two costly interceptions. He also ran the ball 7 times for 45 yards and a touchdown. James Stewart gained 80 yards on 14 rushing attempts and Natrone Means contributed 24 yards on seven rushes as well as a TD on his lone catch. WR Keenan McCardell had five pass receptions for 52 yards and Andre Rison gained a team-leading 74 yards on his three catches. On defense, DE Clyde Simmons accounted for 2.5 of the team’s sacks. The win signaled a turnaround for the Bengals as they won their next two games on the way to a 7-2 finish. They ended up breaking even at 8-8 and placing third in the AFC Central. The Jaguars also caught fire, winning six of their last seven games to go 9-7 and secure a Wild Card playoff slot. They advanced all the way to the AFC Championship game before falling to the Patriots. Unfortunately for Bruce Coslet, the initial success did not last. 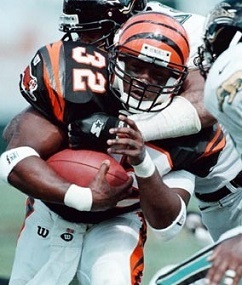 The Bengals followed up with a 7-9 record in 1997 and dropped to 3-13 in 1998 and 4-12 ’99. He was dismissed three winless games into the 2000 season, having compiled a 21-39 record in Cincinnati.